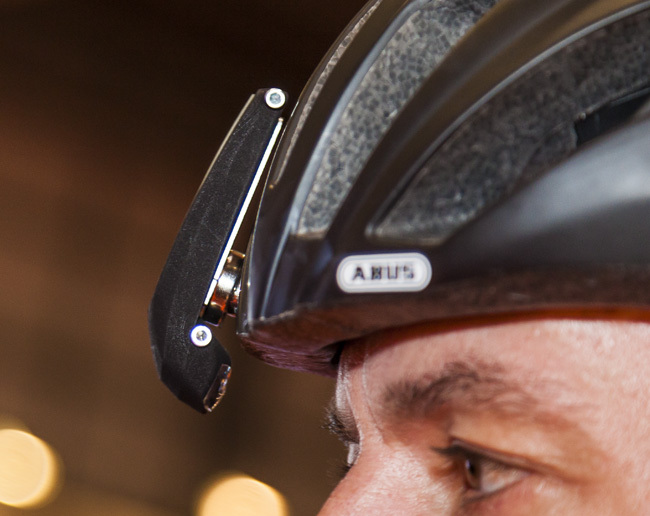 >>> Could this sticker revolutionise the way we analyse cyclists? 4Vision is set to be an affordable heads up display that can be attached to any helmet and worn over a pair of glasses. It is currently at the prototype stage, but it is intended that it will display your metrics, such as speed, heart rate or power. Dirk Sandrock showing us his 4Vision heads up display. When we have previously reported on heads up displays, many of our readers perceive them to be dangerous. However, designers of such systems insist they are safer than looking down at a screen on your stem. This is because you can choose not to look at a heads up display, but if you do look at it, any hazards are still in your peripheral vision. >>> Headphones that are potentially safe when riding. It is intended that the system will work on any helmet. The system is removable and here we can see the magnet on the rear and the lens detail. The magnet was very secure on the prototype. The O-Synce Coach Smart is a reasonably priced bike computer that is both ANT+ and Bluetooth Smart. 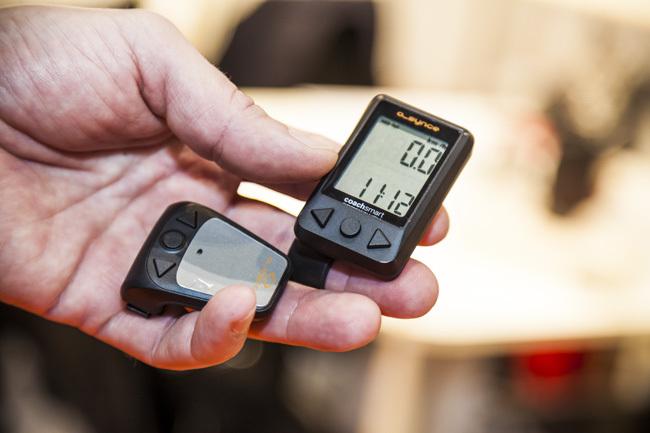 The devices is designed to sync to your smartphone in order to utilise the GPS functionality. 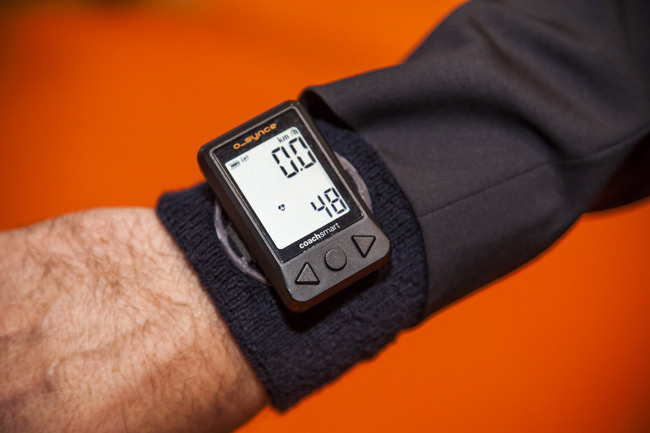 With an RRP of £69 it is more affordable than a Garmin, making it an attractive option. The unit mounts to your bike by way the same system found on Garmins. This is great, as it makes it compatible with existing products such as K-Edge. The O-Synce computer and remote control. The unit is very small and light. We also saw a prototype wrist band. A simple but cool solution. The O-Synce Coach Smart is small and light, making it perfectly useable on ones wrist while doing other activities. The wrist band looks comfortable and effectively turns your computer into an affordable smart watch. 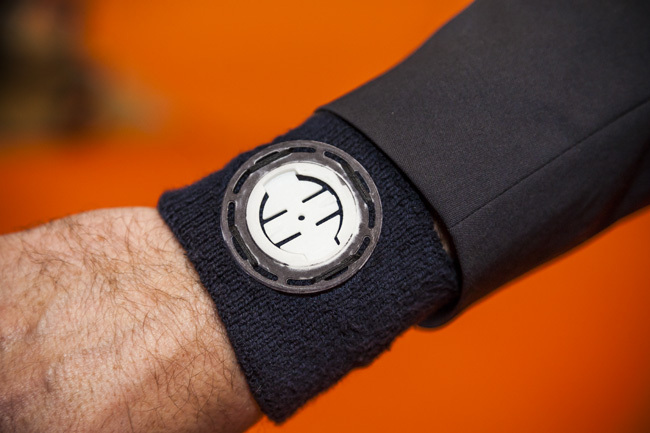 The unit is small enough to be comfortably worn as a watch too. An ingenious prototype wrist strap, with Garmin mount. 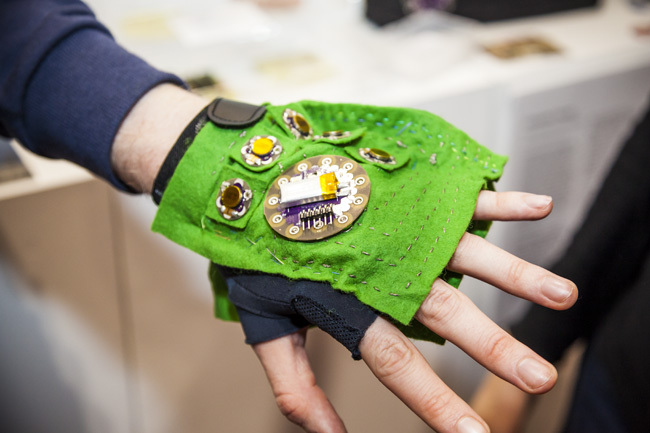 A prototype glove being developed by Antonella Mazzoni at Queen Mary University has the potential to aid deaf cyclists. The glove features sensors which can detect sound and translate it into vibration. We envisage this could help deaf cyclists hear vehicles approaching from behind or car horns. The glove is an early (working) prototype. Glofaster bike wear is a British company that aims to produce fashionable bike wear that is also functional. 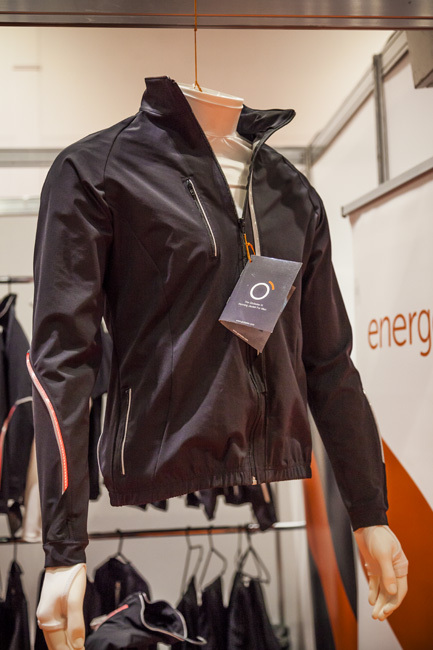 Having been previously featured on Dragons Den the clothing features LEDs for high visibility while riding in low light. The jacket pictured below is £165 and available from their website. We would like to see some lights on the shoulders. 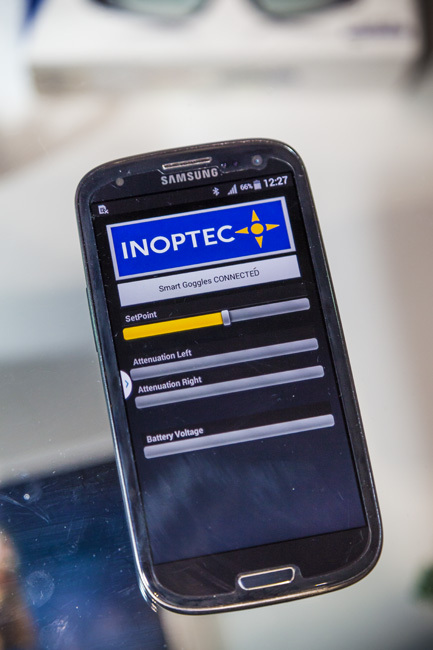 Inoptec glasses are a great invention for cyclists. Although we have to state that the image below is of a working prototype! Inoptec was keen to stress that the finished product will not look anything like what is pictured below, admitting that the product is not at all stylish in its current guise. The two lenses can work independently, working off different sensors. So what does it do? 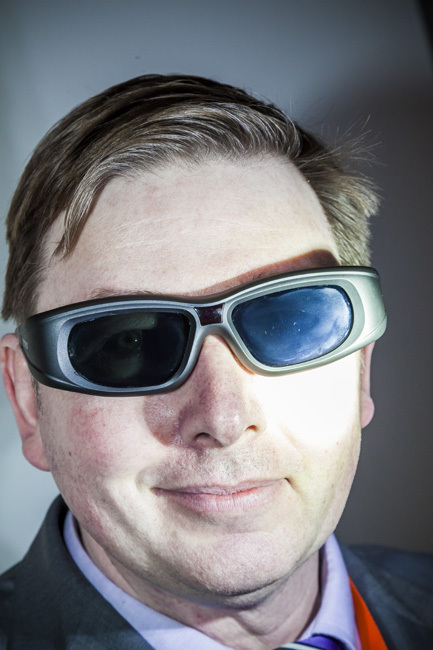 These glasses react rapidly to changes in light, as quick as 0.1 millisecond. We feel that this makes them especially useful for riding. When descending at speed you want to be wearing glasses to protect your eyes from the wind, but the moment you enter a tunnel everything turns black. This wouldn’t be a problem, with these glasses. 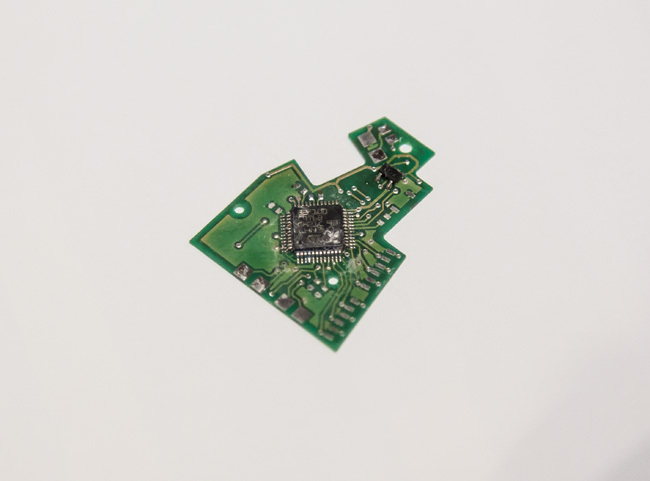 The chip and circuit board that is at the heart of the system. Night riding would be improved by wearing these glasses too, as headlight dazzle would be eliminated. More broadly speaking you would only need one pair glasses, with little need to change lenses for different lighting conditions. We are informed that there is a great deal of military interest. Bluetooth integration of the glasses with smartphones. The glasses can be synced to a smartphone, to manually control them, or calibrate them based on the users preferences. We look forward to seeing how this product develops into something usable on the bike. OLEDs (organic light emitting diodes) have huge potential in a variety of applications. OLED displays can be produced cheaply and can also be combined with solar cells, removing the need for batteries. We saw an innovative application, in the form of a glove, which features an indicator light. 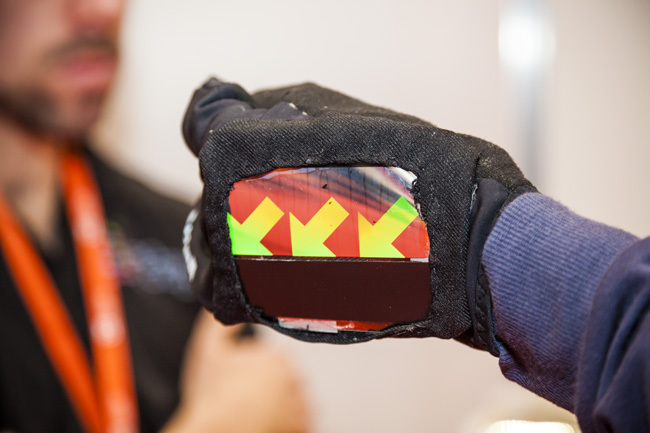 A prototype indicator glove, with integrated OLED screen. Still at the prototype stage this glove was easy to use and the OLED was removable, so that the glove can be washed. An interesting idea that could be of use to commuters. 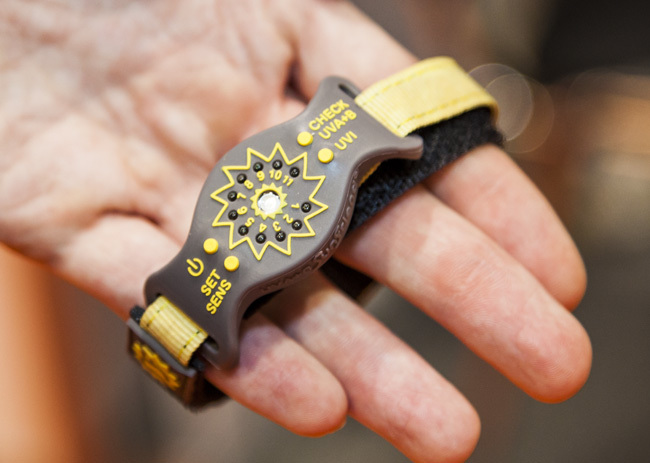 SunFriend is wrist worn sensor that utilises a gallium nitride semi-conductor to measure the amount of UV light you are exposed to. The unit then suggests when you should put on sunscreen. While this is not a cycling specific product in its current guise, the makers see potential. 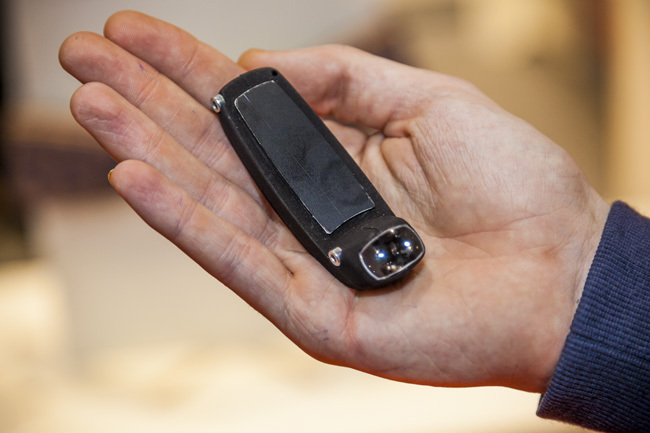 The device could communicate with your bike computer and potentially be built into a bike computer or cycling accessory. In its current guise the system is worn on the wrist. Considering cyclists spend a huge amount of time outside and often in the sun, this would be very useful and would stop needlessly applying cream. By syncing with a smart phones you can customise the device based on your specific skin type and melanin, as different skin types can tolerate different levels of UV. We saw several sleep monitoring systems. Sleep appears to be big business in 2015 and is hugely important to cyclists, being crucial for proper recovery. Beddit is a strap that is positioned under sheets in a seemingly unobtrusive manner, measuring the quality of your sleep. Beddit is sleep monitoring strap that sits under your sheets. 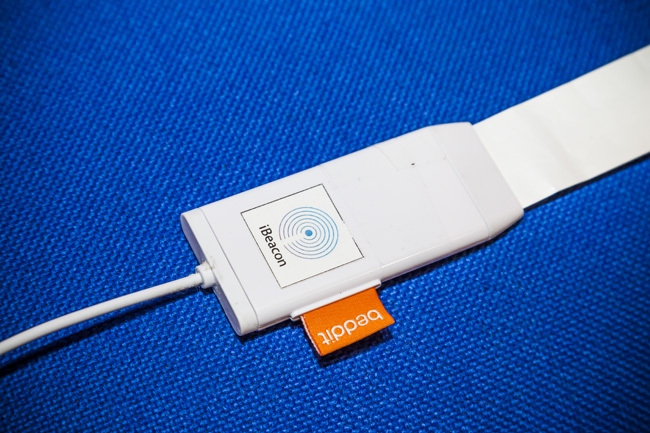 It detects your heart rate, movement and communicates to your smart phone. This results in a sleep score which builds up a picture over a period of time, to measure stress, fatigue and recovery. If an athlete is over training, devices such as this can indicate that you need to back off and get more rest. Ohmatex is a smart textile company that are currently working on a number of technologies. Ohmatex told us that it cannot currently accurately measure perspiration, but it is something it is working on. This would enable athletes to know how much they are sweating and therefore how much fluid/electrolytes to take on. The company did however show us this flexible strain gauge. What is so special about it you ask? Well, it could be used to make power meters that are incorporated into bike clothing that are lightweight and able to measure specific muscle activity. 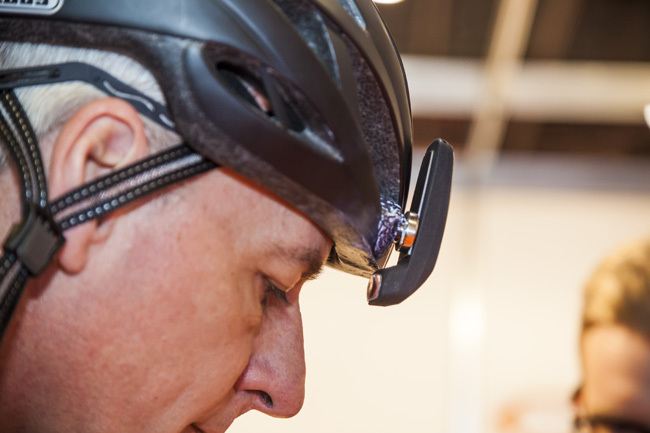 Could this be the future of power measurement and injury prevention? 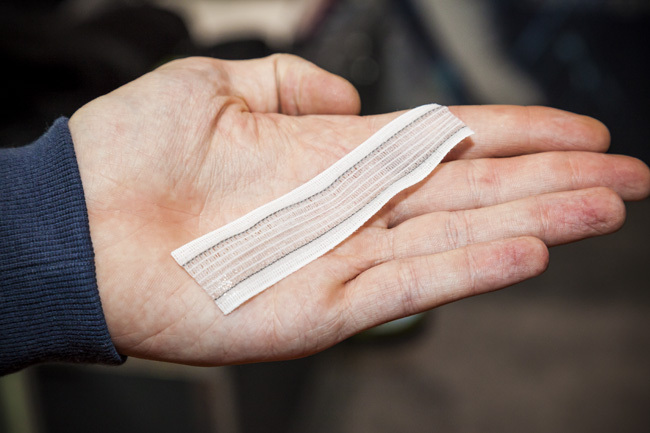 A flexible strain guage, could be used to measure individual muscle performance when incorporated in clothing.